* District 9 Wrestling minipolls are active on the Front Page. Powerade Tourney (Dub) - results offsite, but detailed! 12/26/01 - Six Tickets for Sale AA/AAA - check details at link provided. * District IX Returning Placewinners, both AA and AAA are posted. 12/24/01 - Matt Geer of Brookville died Sat AM. Obituary file linked. RIP. ## Check back in the Postings occasionally - when missing box scores come in, I will make a marginal note that they are now available... ed. * upgrade to Penns Valley Tourney results posted. * Additional article on the McDowell Tourney - Brockway/ St. Mary's BOTH impressive!! 12/20/01 - Johnsonburg wrestles on Friday, January 18. That means that all teams participating in the Mid-Season Classic will receive 3 pounds instead of two. * Bradford @ Warren - dual was cencelled; Bradford entered Warren Tourney in its place. 12/12/01 - Major upgrade of the PJW pages; info on this year's tourneys; links to 98, 99, 00, and 01 tourneys as well! * lengthy story posted on the CUP-PSU match last night. I have never been accused of being brief. * Full roster posted for Oswayo Valley, including their Otto-Eldred co-op members. * some discussion taking place about alumni listings. Who decides. etc? Basically, info is posted as it becomes available. If your program has significant alums that you would like to see info posted on, please send it in and it will get posted. We can't post what we don't have. There have been a SLEW of great kids come through our programs, some of whom went on to wrestle in college, some went on to do other great things! We all play "I wonder what ever happened to ### ?" Let us know, if YOU know! * District IX Trivia is posted - compiled by Bob Imhof of Ridgway. More facts than you would have thought possible. Going WAY back. And yes, the columns and such are a mess, but it will take TIME to clean them up. Am posting as is in the meantime. Anyone who wants to download the file, clean up the columns and send it back for reposting - you will have the undying gratitude of multitudes of fans. * Also posted the Ridgway History file, also by Bob Imhof. * Clarion Univ -WVU dual story sent in. Clarion-PSU TONIGHT @ Clarion! * Nice Pre-Season Report on the AML from the Olean Times-Herald. * Rosters in place for Redbank, Punxsutawney and Clarion; all rosters in but five. * Brockway 60, Kane 3; no box yet. * Clarion Area Boosters have 20 AAA tickets for sale. * Eric Knapp, one of our supporters/ source of MUCH data has offered some excellent suggestions for organizing that mess I refer to as the Table O' Links. Putting those into effect, you should find the front page much easier to work with. Further suggestions are always welcome. And YES, all the links for Districts, Regions, and States ALL go to the same place. Post-Season-Info is "Under Construction" as they say, but you should still have access to the data in the meantime. * Three more entries to the D9 Alumni List: Randy Stout, Warren Stout, and Ben Darr. * There is a kinda-sorta roster for ACVKU posted based on their lineup for the SR match; not complete. * nice story on Clarion Area: Randy Cathcart nominated for PWCA Hall of Fame this year!! 12/3/01 - Kane roster is in place. Waiting on results of the Mountaineer tourney. >> I just found the results from the Area V tourney and the Area V placements at States - better late than never, I suppose. will try to do better next year. Thanks to Bob Peters for sending these. * watch those calendars - minor schedule changes keep coming in. * Brookville roster is up. * Four sets of AA and AAA tickets available in the D9 Ticket Exchange. * Couple more names added to the Alumni list; If anybody knows of others, please send them in! * Cameron County roster is up! 11/27/01 - Six AA tickets in section 25 for Hershey, 2002 are up for grabs. See the D9 Ticket Exchange. * Bradford has their roster in - thanks, Coach Degolier! 11/25/01 - I definitely have rosters for Brockway, Coudersport, Smethport, Dubois, and Clearfield. Schools should be firming up eligibility lists at this point, so there should be at least a tentative roster available. Send 'em in and I'll post 'em up! On many team pages, I "moved up" the roster from last season, but that is probably inaccurate - to say the least. If there is no roster posted - or what I do have posted is inaccurate, please write and give me updates/ corrections! * Warren is looking for two teams for a Dec 14/15 tourney (16 teams) - info at link. * great write-up on the Lehigh - Lock Haven dual; D9 alumni featured! * comprehensive list of D9 Alumni currently wrestling in college! * great set of links for the upcoming Worlds in Sofia, Bulgaria! * info on CUP's plans to Webcast many of their home matches this year!! 11/18/01 - District IX pre-season Rankings are up. * Rosters are starting to come in as well. * Kyle Cathcart signs letter of intent to wrestle at PSU; may play football as well. 11/16/01 - Johnsonburg schedule is in and posted. We are complete for the season, except for the minor changes that naturally occur. 11/14/01 - Kane is dropping the Olean Tourney to correct their season points. Now need two duals to fill their schedule. Willing to travel. 11/9/01 - the Redbank Christmas Tournament is Dec 28/ 29 - there is a popular misconception that it is the 27/ 28. I have corrected it on team schedules where I have noticed it; if I miss one, let me know. 11/7/01 - only Johnsonburg and Curwensville remain w/o schedules. * Discussion of rules changes posted. PA is NOT adopting the no-leaving-the-weigh-in-area rule. * The draw for starting weight is by mutual agreement of both coaches, just like last year. 11/4/01 - Brookville Duals expands to ten teams: Brockway, Ridgway, Reynolds, Maplewood, Burrell, Mifflinburg, Hughesville, Brandywine Heights, Juniata - and, course, Brookville. 11/2/01 - Punxsutawney and St. Mary's schedules are in place! 10/24/01 - Bradford schedule is in, new coaching staff. * new D6 site is online. 10/23/01 - Brookville and Ridgway have schedules in place. * new coach at Bradford. MATT DEGOLIER takes over this year. 10/18/01 - Cameron County has a schedule up/ coaching & admin changes. 10/16/01 - Oswayo Valley has a schedule up; they also announce a jointure with Otto Eldred! * Eight teams have schedules posted so far! Excellent! 10/12/01 - Port Allegany has their schedule up! 10/11/01 - Sharon cancels PAWF tourney - Redbank picks it up! Sunday, Oct 21!! 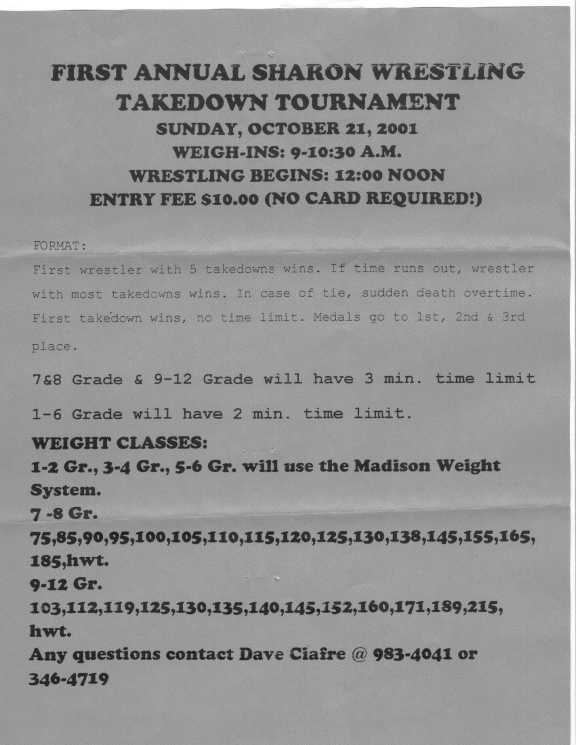 10/6/01 - Sharon announces a Takedown Tournament. This is NOT a web page - it just takes you to a scanned picture of the announcement. Use your BACK button to return here. Sun, Oct 21 - all ages, first grade to seniors. * all calendar pages updated with schedules received so far. 10/2/01 - Kane and Redbank have their schedules posted! thanks, guys! 9/19/01 - Clearfield announces Jan Elementary Tournament (17th Annual). 8/26/01 - posted a link to Reversal: The Movie. New movie about amateur wrestling that is supposed to be great! In theaters now. * The 01-02 calendars are in preparation; anybody who HAS a schedule put together and can send it to me NOW will help tremendously in getting this set up for the season! 6/30/01 - Some new features added to the Front Page - including links to eBay and Half.com - great commercial sites! Guestbook has been updated and is back on line. Team pages have been cleared and reset for the new season. Which means new schedules and rosters as soon as possible! 6/24/01 - Clearfield announces the 3rd Annual Fall Brawl - JH and SH eligible this year! * time to start updating links and setting up for the new season! LOT of activity here by way of the Yahoogroups Maillist. The link to subscribe is on the front page - and if you would like to read the back mail, simply go to YahooGroups, and search for D9Wrestling. Even without a membership (which is free if you want) you should be able to get in as a Guest and read all the back mail - there has been a ton of interesting stuff - UC Davis sacking a successful coach, Dan Gable maybe running for governor of Iowa! - and more. 5/8/01 - Guestbook is back on line! !